With Halloween upon us, its time once again to venture into the unknown. To a place shrouded in mystery where the illogical and unexplainable reign supreme. A place synonymous with the bloodthirsty and the horrific. Yes, nothing says Halloween quite like… well Transylvania to be honest. A beautiful place with a dark past, seemingly trapped in its own time. The region of Transylvania (known as the land beyond the forest) in central Romania is an area of Europe steeped in history. 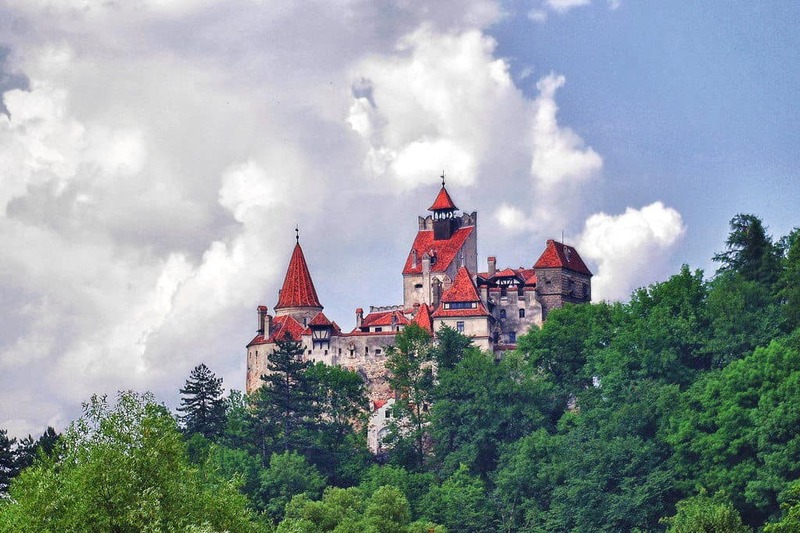 It became internationally renowned as a consequence of the 1897 novel Bram Stoker’s Dracula, loosely based on the bloodthirsty exploits of ruler Vlad Ţepeş and his uncompromising methods for dealing with his enemies and criminals alike. Despite his brutal reputation, Vlad is actually something of a national hero due to his fight for independence, and much of his ferocious nature was in large part considered to be on behalf of national interests. Bram Stoker based his writing on the supposedly bloodsucking vampires that cropped up in Romanian folklore and merely used the Dracula name so synonymous with the area’s history. When combined with the truly medieval setting that remains intact in Transylvania, from the gothic architecture like the 14th Century built Bran Castle (not actually the digs of Mad Vlad) to the wild landscape that is home to a huge population of brown bears and of course more appropriately a healthy contingent of howling wolves, Transylvania retains it’s mythical and otherworldly status. One such area, that while visually stunning, actually looks like its come straight from a Hollywood film set, is the forest of Hoia Baciu. 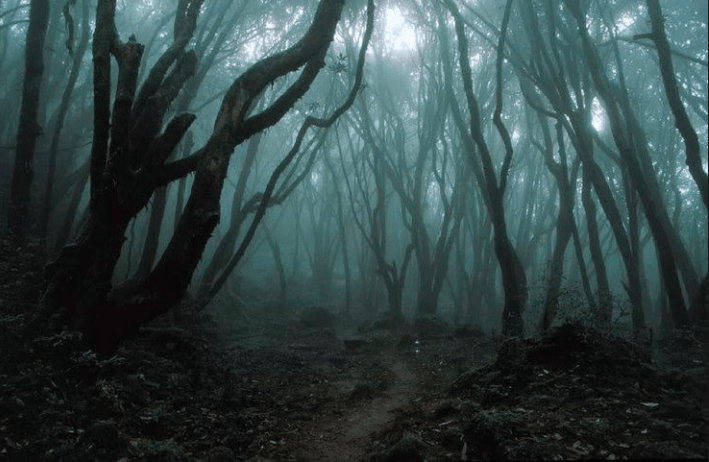 Known locally as the Bermuda Triangle of Romania, this purportedly haunted woodland has gained something of a reputation for its spooky goings-on. Situated to the west of the city of Cluj-Napoca, and named after a shepherd, Hoia Baciu, who many years ago when tending to over 200 sheep went missing in the forest, never to be seen again. 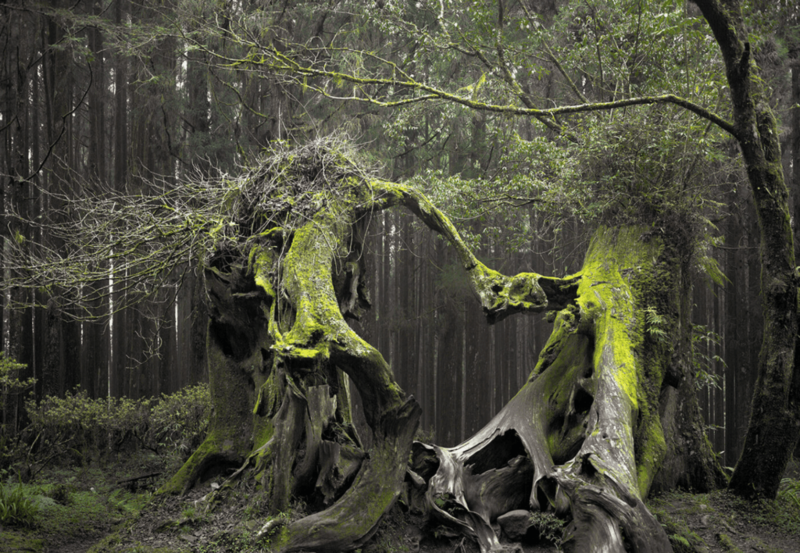 What stands out first and foremost about the Hoia Baciu forest is the bizarre shape and nature of the trees. While strong and sturdy, many are crooked and bent at right angles, spiraling in a clockwise direction, giving a strange twisted dimension to the landscape. In many ways, they add to the mystique of the environment, a deformed yet equally beautiful vision resembling a scene from Sleepy Hollow. Covering around 750 acres in total, the forest is extremely dense. Visitors and locals have both reported a heavy mist that often descends upon the area, in some cases causing darkness, even in the bright midday sun. What is probably the most significant aspect of the landscape, however, is the fact that at its centre lies a near perfect circular clearing. A patch of land where inexplicably, there are no trees or vegetation, nothing grows there or ever has done. At one point scientists carried out numerous tests on the soil, in search of some sort of chemical composition that might inhibit growth, nothing was found, in fact it was deemed no different to the lush and fertile ground elsewhere in the forest. Aside from the shepherd after whom the forest is named, there have been numerous instances of people going missing from Hoia Baciu, although who is looking for the poor souls is not clear. And, to add fuel to the fire many locals attest to reports that upon entering the forest people lose track of time, go missing for a number of hours before returning with no recollection of the period in question. The most talked about example is that of a 5-year-old girl, who, having wandered off into the forest alone disappeared and despite numerous searches was never found until over five years later when she simply reappeared from the forest dressed in exactly the same clothes, presumably a little tight on her now 10-year-old frame. It is claimed she had no recollection of the intervening period. Another case surrounds the woman in white – it wouldn’t be a spooky story without one! As the story goes a bride to be and her fiance were enjoying an afternoon stroll before the young lady turned up unbeknownst to her future husband and set off in the other direction. She completely vanished and was never seen again, until that is her ghostly apparition began to haunt the woods. Only revealing herself to women and children, the bride to be is a regular fixture for those passing through the forest. Aside from the young lady who never made it to the altar, there are numerous cases of supposed paranormal activity attached to Hoia Baciu, it’s a surprise anyone ever steps foot inside the place. It is believed that many, many years ago around 200 Romanian peasants were slaughtered in the forest, and, their tortured souls continue to roam the land trapped in a waking purgatory. With piercing green eyes and shrouded in a black fog, the ghosts of the peasants appear in pairs and well, scare the living daylights out of those who come across them. Many visitors report an irrational anxiety, a deep sense of unease upon entering the forest and a distinct feeling they are being watched. Ghosthunters and everyday visitors report seeing orbs of light, commonplace in areas of paranormal activity, while the accompanying giggles of unseen females that break the eerie silence, or the voices whispering in the distance must make for a terrifying day out that’s for sure. Cell phones and other electronic devices have been known to stop working altogether while in the confines of this weird woodland, and numerous sources claim to have been scratched or physically impressed upon by something in their personal space. Quite possibly the starting point for the legend of Hoia Baciu’s notorious reputation was back in the 1960’s when firstly Biologist Alexander Swift and then Emil Barnea photographed an unusual disc-like object hovering above the forest, supposedly, and in keeping with the legendary status of the area, directly above the circle of land whereby nothing ever grows. More recently in the early noughties, a couple of Cluj citizens themselves claim to have seen an unidentified object meandering above the area. Could extra-terrestrial activity be responsible for the inexplicable passing of time and memory loss that has beset a number of locals and visitors alike? Is it possible that the young five-year-old girl who mysteriously returned all those years later had been abducted by aliens?! Whatever the reality of the Hoia Baciu forestland, and the many tales that accompany its mention, it truly is a wondrous part of the world. A quite stunning landscape, in a country were fiction and fact are as blurry as a photograph of a ghost taken by an eager paranormal enthusiast. We know one thing, it sure looks like a great place for a spot of Halloween camping. Sleep well folks!